This is a portrait of Jenny Pollock, painted by Janet Stone, based on an old photo of Jenny. Jenny Pollock married "Herz" Herzberg in 1863 and gave birth to Hettie Herzberg. Hettie ("Bockie") married Simon Miller ("Daddy Fahler") and gave birth to Jean, Claire, and Pru Miller. "Today I was going through old photo files that belonged to my mother, El Wikler, looking for pictures of Carol Brenner and David Schloss to post on the Website. I did not find pictures of Carol and David, but I did find an incredible treasure. 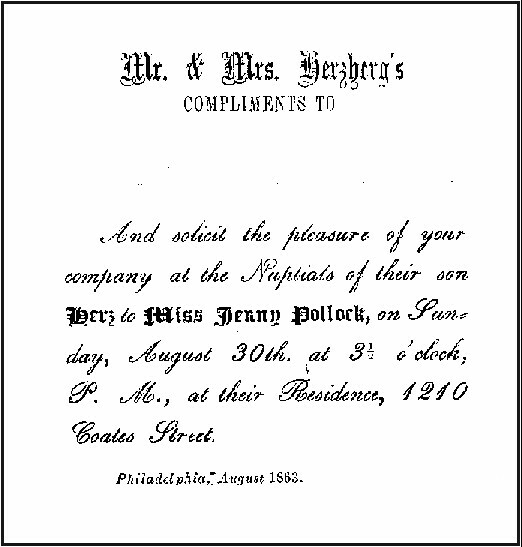 Buried deep in an envelope, I found an invitation from Herz Herzberg's parents to the wedding of their son, Herz, to Jenny Pollock. According to the invitation, Herz and Jenny were married at the Herzberg residence, 1210 Coates Street, Philadelphia, on Sunday, August 30, 1863, at 3:30 p.m. -- 137 years ago!"